Russia's Space agency, Roscosmos, announced Wednesday that the midpoint in a three day window when Phobos-Grunt’s debris is expected to fall is at 0918 GMT Sunday, when the probe will be above the ocean, about 1,700 kilometers (some 1,050 miles) west of Jakarta. Phobos-Grunt weighs 13.2 metric tons (14.6 tons), which includes 11 metric tons (12 tons) of highly toxic fuel. Experts had warned that if the fuel has frozen, it could survive re-entry through the atmosphere and pose a serious threat if it falls over populated areas. But Roscosmos has insisted that it is sure that all the fuel will burn on re-entry some 100 kilometers (330,000 feet) above the ground and pose no danger. It said that a tiny quantity of Cobalt-57, a radioactive metal contained in one of the craft’s instruments, will not pose the threat of radioactive contamination. The agency has predicted the debris could fall between Saturday and Monday anywhere along a broad swath between 51.4 degrees north to 51.4 degrees south that covers the bulk of the land surface. That spares most of Russia’s ground territory, along with Scandinavia and a large part of Canada. The $170-million probe was to explore one of Mars’ two moons, Phobos, but became stranded while orbiting Earth after its Nov. 9 launch. Engineers in Russia and the European Space Agency have tried but failed to propel the spacecraft toward its target. The Phobos-Grunt probe launched successfully, but then failed to fire the engine to put it on the correct path to the Red Planet, that if adjusted would reach Mars in late 2012. Russian space agency officials first announced that the craft was stuck in an Earth orbit and that engineers had three days to correct the fault before the probe's batteries run out. The venture is also carrying China's first Mars satellite. Yinghuo-1 is riding piggyback on Phobos-Grunt. The two craft lifted off from the Baikonur cosmodrome in Kazakhstan on a Zenit rocket at 00:16 local time on Wednesday (20:16 GMT Tuesday) and were dropped off in an elliptical orbit around the Earth 11 minutes later. Scientists had hoped the dusty debris would provide fresh insights into the origin of the 27km-wide moon, which many scientists suspect may actually be a captured asteroid. The total mass for the mission with all its fuel is more than 13 tons. That makes the venture the biggest Solar System expedition ever, a title previously held by the six-tonne Cassini-Huygens craft launched to Saturn in 1997. US participation comes in the form of the space advocacy group, The Planetary Society, which is sending its Living Interplanetary Flight Experiment (LIFE) on Phobos-Grunt. This package of hardy micro-organisms will make the journeys out and back inside a separate compartment in the return capsule, testing theories on how living organisms could spread through the Solar System by simulating aspects of the long-duration voyage that microbes could make in a meteoroid that has been blasted off one planetary body and landed on another. The microscopic participants in LIFE include the bacterium Deinococcus radiodurans, known for its ability to withstand high doses of radiation, and the eight-legged tardigrade (or "water bear"), a microscopic invertebrate that has already demonstrated its ability to survive short exposure to the space environment. Russian space agency officials say neither burn on the big cruise stage took place. If it is a software error, new commands could be uploaded to correct it. Hardware failure would doom the probe unless a switch to a back-up system is possible. Almost two and a half hours into the mission, the huge cruise stage attached to Phobos-Grunt should then have made the first of two firings, to raise the orbit and to send the mission on to Mars. Russian officials say neither of those planned engine burns occurred. Reports suggest the spacecraft attempted to orientate itself in space using the stars, failed to pick them up and therefore did not execute the firings as planned. "It looks like the engine system has not worked," Vladimir Popovkin, the head of the Russian space agency (Roscosmos), explained to the BBC. "It seems it couldn't reorient itself away from the Sun towards the stars so the sidewall closed. It was foreseen by the flight program. Now, we have found its location, and we have to unpack the sidewall, to check the telemetry and after that we will restart the spacecraft control program to reboot the mission. The craft is in a support orbit. The fuel tanks were not jettisoned after the first switch-on." And he added: "I would not say it's a failure; it's a non-standard situation, but it is a working situation." If the problem is simply a software issue and engineers can upload new commands, they have a chance of rescuing the mission. If the fault lies in a hardware malfunction, Phobos-Grunt may well be doomed. Russian scientists were hoping Phobos-Grunt would end a bad streak of luck for Russian Mars missions: Moscow has despatched a total of 16 missions to the Red Planet since the 1960s. None has successfully completed its goals, with the most recent endeavour – the sophisticated Mars-96 spacecraft – being destroyed in a failed launch. After dumping the cruise stage and releasing Yinghuo-1, the main spacecraft would then manoeuvre itself into position to land on Phobos. Phobos-Grunt is a hefty spacecraft, requiring several elements to complete the tasks of travelling out to Mars, landing on Phobos, picking up its samples and then despatching them home. Detailed mapping of the moon has been conducted by the European Space Agency's Mars Express (MEx) satellite, and this information is being used to identify a suitable location to land in February 2013. After landing, a robotic arm will pick up samples of the regolith, which will be analysed there and then, but a portion of it – about 200g – will be transferred to a canister for return to Earth. This canister and its departure stage should be sent home within a few days of Phobos-Grunt's arrival on the moon. If all goes well, the canister should fall to Earth in the Kazakh desert in August 2014. The oddly-shaped Phobos has been studied extensively by passing satellites, it still holds many secrets – not just about itself, but also the planet below. It is one of two moons at Mars (the other being Deimos). It has an extremely low density, indicating it probably has many interior spaces. The origin of Mars' moon, Phobos (fear in ancient Greek), is a mystery, but three theories are considered plausible. The first is that the moon is a captured asteroid; the second is that it formed in-situ as Mars formed below it, and the third is that Phobos formed later than Mars, from debris flung into martian orbit when a massive meteorite struck the Red Planet. A fourth, far more radical and controversial (although thoroughly intriguing) theory is one that has been kicking around for decades: that Phobos is a artificial object in Mars orbit -in short, a 1.5-mile-long, extremely ancient spacecraft. 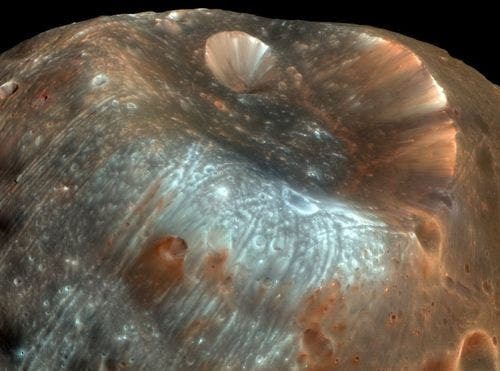 In a recent development, scientists say they have uncovered firm evidence that Mars' largest moon, the mysterious Phobos, is made from rocks blasted off the Martian surface in a catastrophic event, solving a long-standing puzzle. It has been suggested that both Phobos and Deimos could be asteroids that formed in the main asteroid belt and were then "captured" by Mars' gravity. An alternative theory suggests that Phobos could have been formed from the remnants of an earlier moon destroyed by Mars' gravitational forces. However, this moon might itself have originated from material thrown into orbit from the Martian surface. Previous observations of Phobos at visible and near-infrared wavelengths have been interpreted to suggest the possible presence of carbonaceous chondrites, found in meteorites that have crashed to Earth. This carbon-rich, rocky material, left over from the formation of the Solar System, is thought to originate in asteroids from the so-called "main belt" between Mars and Jupiter. Data from the European Space Agency's Mars Express spacecraft appears to make the asteroid capture scenario look less likely. Recent observations as thermal infrared wavelengths using the Planetary Fourier Spectrometer (PFS) instrument on Mars Express show a poor match between the rocks on Phobos and any class of chondritic meteorite known from Earth, which seems to support the "re-accretion" models for the formation of Phobos, in which rocks from the surface of the Red Planet are blasted into Martian orbit to later clump and form Phobos. talian National Institute for Astrophysics in Rome.These phyllosilicate rocks are thought to form in the presence of water, and have been found previously on Mars. "This is very intriguing as it implies the interaction of silicate materials with liquid water on the parent body prior to incorporation into Phobos," said Dr Giuranna. "Alternatively, phyllosilicates may have formed in situ, but this would mean that Phobos required sufficient internal heating to enable liquid water to remain stable." Other observations from Phobos appear to match the types of minerals identified on the surface of Mars. Thus, the make-up of Phobos appears more closely related to Mars than to asteroids from the main belt, say the researchers. In addition, said Pascal Rosenblatt of the Royal Observatory of Belgium, "the asteroid capture scenarios also have difficulties in explaining the current near-circular and near-equatorial orbit of both Martian moons (Phobos and Deimos)". The researchers also used Mars Express to obtain the most precise measurement yet of Phobos' density. "This number is significantly lower than the density of meteoritic material associated with asteroids. It implies a sponge-like structure with voids making up 25%-45% in Phobos's interior," said Dr Rosenblatt. A highly porous asteroid would have probably not survived if captured by Mars. Alternatively, such a highly porous structure on Phobos could have resulted from the re-accretion of rocky blocks in Mars' orbit. In describing the internal geometric structure of this "moon" as revealed by MARSIS, European Space Agency (ESA) sources emphasized that "several of these interior Phobos compartments also appear to still be holding some kind of atmosphere …." which has given birth to wild speculation that Phobos could prove to be an artificial satellite of some sort. The source repeated this several times … raising all kinds of fascinating questions regarding "how" the radar could, in fact, determine this — that some of the vast "rooms" inside Phobos ("from a quarter to half-a-mile in diameter …") were "maintaining an internal pressure."